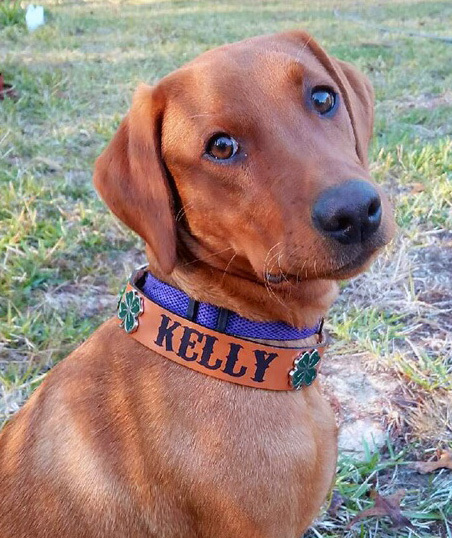 Personalized Leather dog collars. We have shotgun shell dog collars, Texas flag dog collars, star leather dog collars, rebel flag leather dog collars. All dog collars come with your pets name engraved as shown and 2 conchos we attach to collar. These are made with the same leather we make our belts. 9/10 oz cowhide with one piece of leather, not composite or pieced leather. We do thin the leather down for comfort. We offer 3 sizes in the 1 1/4" width and 1 size in 1". Our dog collars are proudly made by us in High Springs, Florida.